From left are Professor Youngkyo Seo of Life Sciences and Dr. Jitendra N. Tiwari of Chemistry in their lab at UNIST. Their research findings, published in the January issue of the journal ACS Nano. A recent study, affiliated with UNIST has developed a new method of repairing injured bone using stem cells from human bone marrow and a carbon material with photocatalytic properties, which could lead to powerful treatments for skeletal system injuries, such as fractures or periodontal disease. 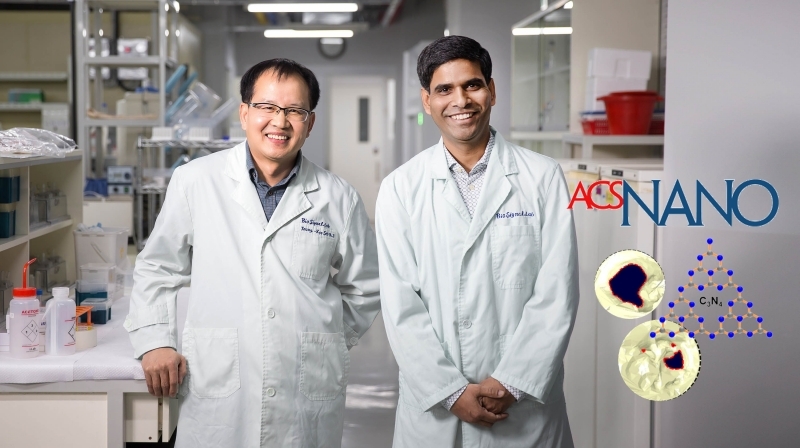 This research has been jointly conducted by Professor Youngkyo Seo of Life Sciences and Dr. Jitendra N. Tiwari of Chemistry in collaboration with Professor Kwang S. Kim of Natural Science, Professor Pann-Ghill Suh of Life Sciences, and seven other researchers from UNIST. In the study, the research team reported that red-light absorbing carbon nitride (C₃N₄) sheets lead to remarkable proliferation and osteogenic differentiation by runt-related transcription factor 2 (Runx2) activation, a key transcription factor associated with osteoblast differentiation. The results of the study has been published in the January issue of ACS Nano journal. The reserach team expects that this research breakthrough could lead to enhancement of bone regeneration. ▲(Upper left) Chemical bonding and physical structure of C₃N₄4 sheets. (Lower left) In a liquid state, red light is transmitted at a maximum of 450nm and emitted at a wavelength of 635 nm. (Right) After 4 weeks of loading C₃N₄4 sheets into the skull-damaged mice, the skull was regenerated by more than 90%. The use of human bone marrow-derived mesenchymal stem cells (hBMSCs) has been tried successfully in fracture treatment due to their potential to regenerate bone in patients who have lost large areas of bone from either disease or trauma. Recently, many attempts have been made to enhance the function of stem cells using carbon nanotubes, graphenes, and nano-oxides. In the study, Professor Kim and Professor Suh examined the C₃N₄sheets. They discovered that this material absorbs red light and then emits fluorescence, which can be used to speed up bone regeneration. Professor Kim’s team synthesized carbon nitrogen derivatives from melamine compounds. Then, they analyzed the light-absorbing characteristics of C₃N₄sheets at a wavelength range of 455-635 nanometers (nm). As a result, the C₃N₄sheets were found to emit fluorescence at the wavelength of 635 nm when exposed to red light in a liquid state. At this time, the released electrons induced calcium to accumulate in the cytoplasm. Professor Suh conducted a biomedical application of this material. First, stem cells and cancer cells were cultured in a medium containing 200 μg/ml of C₃N₄sheets. After two days of testing, the material showed no cytotoxicity, making it useful as biomaterials. It was also confirmed that C₃N₄sheets act on stem cells to differentiate into osteoblasts to promote mineral formation. In this process, the osteogenic differentiation marker genes (ALP, BSP, and OCN) proliferated. Moreover, the Rux2 (Runt-related transcription factor 2), a key factor in osteoblast differentiation was also activated. This resulted in the increased osteoblast differentiation and accelerated bone formation. The research team expects that their findings affirm the potential of C₃N₄sheets in developing bone formation and directing hBMSCs toward bone regeneration. This research was carried out with the support of the National Honor Scientist Program and the technology development project of the aging source, which is promoted by the Korean Ministry of Science, ICT and Future Planning. 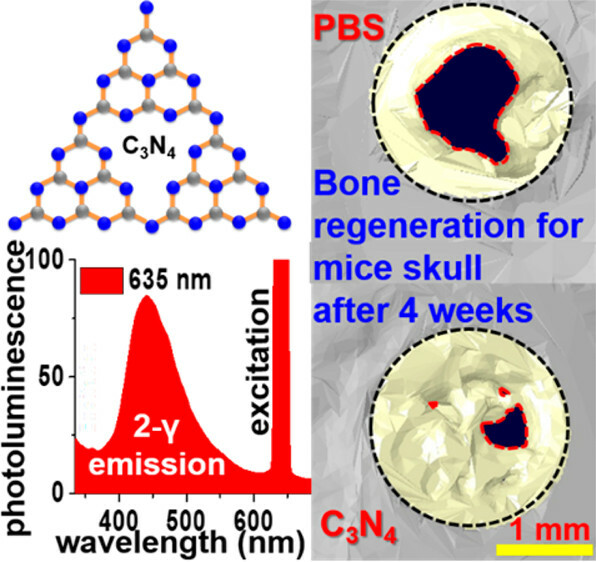 Jitendra N. Tiwari, et al., “Accelerated Bone Regeneration by Two-Photon Photoactivated Carbon Nitride Nanosheets,” ACS Nano, (2017).